Are Versatility and Portability Really The Key Selling Points Of The Schumacher PSJ-1812 Jump Starter? 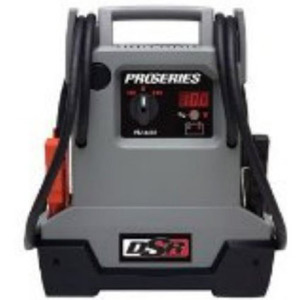 It is automatically clear from the features of the Schumacher PSJ-1812 DSR ProSeries 1800 Peak Amps Jump Starter and Portable Power Unit that the designers have tried to create something powerful and effective with its 1800 peak amp, 225 cold cranking ampere and 28 inch cables. But it is the idea of it being a portable power unit for “comparing, tailgating and power outages” that is more intriguing. This product also boasts a polypropylene case and automatic charger and it is claimed that with this unit “you will never be stranded without power again”. It is a bold promise but can Schumacher live up to it? 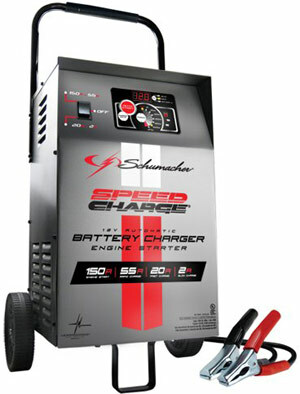 The Schumacher SE-1555A Automatic Elite Wheel 12 Volt Battery Charger with Engine Start is an advanced electrical machine that runs on microprocessor technology, it has the ability to regulate voltage and current output of your battery unit for a more efficient power output. This contrivance is built to reduce charge time while also maximizing the overall cell life, it works well with both small and large scale batteries. Furthermore, SE-1555A contains a pair of LED light indicators which shine bright when the battery is full and also help in monitoring the reverse hook-up protective features. Is The Schumacher PSJ-4424 Jump Starter As Powerful and Professional As It Suggests? 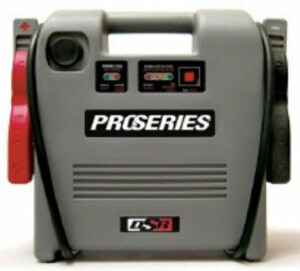 The Schumacher PSJ-4424 Jump Starter is part of the brand’s ProSeries and the specification reflects this idea that it is a high-end, professional tool with plenty of power. This portable device uses 4400 peak amps, 500 cranking amps and 415 cold cranking amps and has a built-in automatic charger and LED display to add to the reliability. 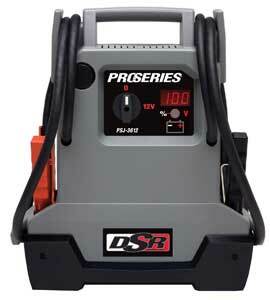 Other features include the two 22Ah AGM batteries, 12V DC power outlet and heavy duty clamps. Have the designers done enough to make this pricier product worth more than its rivals? Could The Schumacher PSJ-3612 Jump Starter Put New Life In Your Car? For anyone that has suffered the cost and annoyance of having to call someone out to jump start a dead car, the idea of a compact and powerful personal jump starter like the Schumacher PSJ-3612 Jump Starter will be highly appealing. This model uses a series of amps, two 18AH high output AGM batteries and a 12V DC power outlet to help you restart a dead battery with ease. In addition to this, the Schumacher jump starter also contains a 3 amp built-in battery charger and heavy duty clamps. JumpStarterReviews.org is a participant in the Amazon Services LLC Associates Program, an affiliate advertising program designed to provide a means for sites to earn advertising fees by advertising and linking to amazon.com. Copyright © 2019 · Jump Starter Reviews, All Rights Reserved.